Born in South Carolina in 1923, Brevard Springs Childs spent the bulk of his professional life in the northeastern United States, Germany and the United Kingdom. He attended Princeton Seminary and was for more than forty years Professor of Old Testament at Yale University (1958-1999). He and his wife Ann had for many years divided their time between Bethany, CT, where he lived near good friends Leander Keck and Lou Martyn, among others; Cambridge, England; and Chautauqua, NY. At the time of his death he had completed a manuscript on the canonical implications of the Pauline Letter Collection, to be published this coming Fall. Professor Childs single-handedly effected major and sustained changes in the conceptual framework of modern biblical studies through appeal to the canonical presentation of biblical books and the theological implications of attending to their final form. At the same time, he was entirely at home in modern biblical critical methodology, and is arguably the American scholar most to have had an impact on the Continent where these methods were first honed. Trained at Basel in the exciting post-war period, he experienced firsthand the rigorous environment of form-criticism, and its precursors in source and literary criticism. More than this, he saw the way in which biblical and theological studies were integrated disciplines, or at least felt compelled to give account of one another — a legacy which lived on in his own writings. 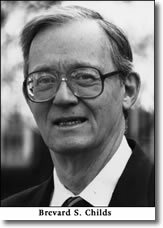 After a series of form-critical studies (1960-67), Childs embarked on a publishing career that demonstrated his enormous range and technical sophistication: a study of the uneven reception of the continental Biblical Theology movement in the US, with a proposal for a canonical approach to both Testaments (1970); a painstaking deployment of critical methods in the service of interpreting Exodus, with a fresh appraisal from the side of canon and the history of reception (1974); a groundbreaking Introduction to the Old Testament (1979) followed by a theological assessment of the Old Testament as Christian Scripture (1985). Never to be constrained by the fashions of scholarship, in 1984 Childs published a detailed account of modern New Testament scholarship with an eye toward a fresh canonical introduction. With these important works behind him, he was finally able to tackle a project in large measure untried since the nineteenth century, namely, a Biblical Theology of Old and New Testaments. Heidelberg's Rolf Rendtorff could conclude that a work many had regarded as impossible, Childs not only undertook but impressively executed. Childs's control of the history of ideas, especially continental scholarship; his immersion in the apparatus of classical theological reflection from the Reformation period and from the wider history of biblical interpretation; his technical training in Hebrew language; and his deep love of and concern for the church, and the way the Bible made its renewing voice heard, as the speech of God for every age: these characteristics of the man and his work mark him off as a scholar whose best analogies are to be found in figures like Jerome, Chrysostom, Aquinas, Luther, Calvin, or his teacher from a more recent day, Karl Barth. No one who ever heard him lecture will forget his carefully composed prayers, and no one who heard him preach or pray will have failed to note a man of great learning, humility, Godly fear, and deep Christian hopefulness. If a biblical figure were to be chosen for comparison—something Childs would have balked at—it might well be the prophet Isaiah. He generated a public account of the Bible and theological reflection that met with resistance as well as consideration. He raised up a generation and more of carefully trained students. His books were opened by generations who never knew him. And he went about his work with a confidence in the final providential superintendence of all things by the same God who sent him forth and sustained him. Unsurprising, then, was the appearance in retirement of a commentary on the entire book of Isaiah (2001)—something not customarily undertaken—and a careful assessment of the reception of Isaiah in the history of church and synagogue (2004), where Childs's livelong attention to hermeneutics and theological method can be seen at work across the generations, confronted then as now by the word of God spoken through the prophet Isaiah. As we mark and mourn his passing, we lean into the confident hope that Brevard Childs will be read and heard, and his work furthered, well beyond the years he gave us. He was never a man to call attention to himself, but rather to point to the God who in every generation raises up women and men of faith, to extend the legacy of prophet and apostle in their own way, in their own generation. This challenge never failed to energize Brevard Childs, and we who give thanks for his life do so in gratitude to the God who sent him and gave us these years of service and proclamation, always to God's greater glory. May God grant him joy and rest eternal with the saints from every age.